The bins are now in a warm place for the casing layer to colonise. I love your posts!! I wish that all posts here could be as rich in good, well illustrated info. My hats off to you and your efforts. Fantastic, wow that's quick colonization, what was your spawn rate per bag, and did you shake the bag any during colonization or just leave it alone? Bags were spawned with 300 ml of colonised rye grain. They were shaken every day, because the substrate and the spawn don't mix very easily (grain kernels fall through the substrate and collect at the bottom of the bag). This species really is amazingly fast! Good work. Might be because I am a nub to shrooms in general, but i am impressed. Nice post work, too. 300 ml each bag or 300 ml to all bags ? how big are those air holes, and would they provide sufficient air for no fanning to be required? Would the same airhole setup work for cubensis? 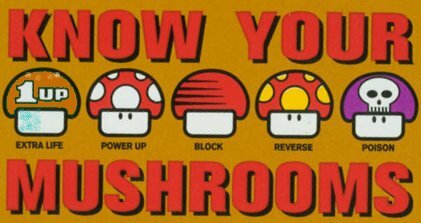 Why it shouldn't work with P.Cubensis? They also need air exchange. I was thinking since the pans generally have less surface area, that they may produce less CO2 and therefore require less air exchage. I was simply wondering if those holes would provide sufficient air exchange for cubes as they seem to have more surface area and may produce more CO2. But that was just a guess, and that's why I asked. Well, I cased another batch last night and I made similar holes and filled with polyfill as pictured above. I guess Ill see if there's enough air exchange from the holes. Anyone had any experience with this in the past/present? please let me know if I should still be fanning and such. One of the bins was put under fruiting conditions today. A watering, light and increased aereation (the top bin has four mesh covered holes). 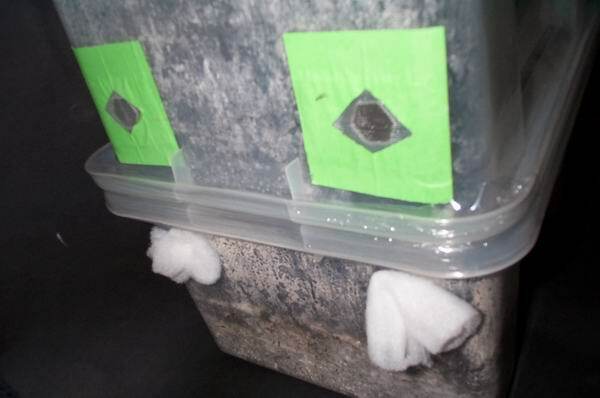 The two bins are taped with polythylene wrap to prevent the entry from fruitflies (a big problem at the moment). what was used for the humidification? Just curious about your casing recipe, you seem to know what you're doing. What do you normally use and yhow do you prepare it? The ingredients are mixed in dry form and while stirring water is added. The amount of water of course depends on the moisture content of the peat. The object is to get as much water in the casing soil as possible without turning it into mud. If the casing gets too wet just add a little more dry ingredients. This casing soil is then filled into oven bags (made of nylon), autoclave bags (PP) or jars and these are sterilised for one hour in the pressure cooker. When the soil has cooled down to room temperature it's ready to use. How was proper humidification achieved? 13,774 topic views. 0 members, 0 guests and 0 web crawlers are browsing this forum.